Is religion a plague on humanity or essential for “the good life”? Yale University theologian Miroslav Volf contends that even though some kill and commit atrocities in God’s name, “attachment to God amplifies and deepens enjoyment of the world.” Volf is the director of the Yale Center for Faith and Culture and author of several books, most recently Public Faith in Action: How to Think Carefully, Engage Wisely, and Vote with Integrity and Flourishing: Why We Need Religion in a Globalized World. He’ll be joining Dr. Scot Sherman in conversation on why religion matters. The evening will begin with a wine and hors d’oeuvres reception followed by an interview and book signing. 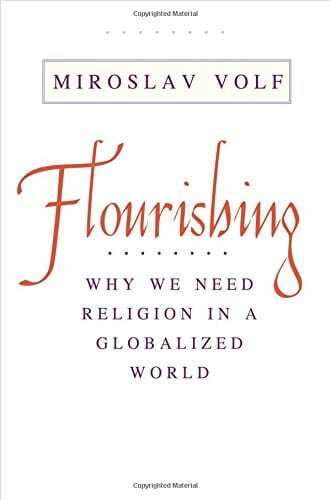 Copies of Flourishing: Why We Need Religion in a Globalized World will be available for purchase. Miroslav Volf is the Henry B. Wright Professor of Theology at Yale Divinity School and the Founder and Director of the Yale Center for Faith and Culture. He was educated in his native Croatia, the United States, and Germany, earning doctoral and post-doctoral degrees (with highest honors) from the University of Tuebingen, Germany. He has written or edited more than 15 books and over 70 scholarly articles. His most significant books include Exclusion and Embrace (1996), winner of the Grawemeyer Award in Religion, and one of Christianity Today’s 100 most important religious books of the 20th century; After Our Likeness (1998), in which he explores the Trinitarian nature of ecclesial community; Allah: A Christian Response (2011), on whether Muslims and Christians have a common God; and A Public Faith: How Followers of Christ Should Serve the Common Good (2011). His most recent books, Flourishing: Why We Need Religion in a Globalized World and Public Faith in Action: How to Think Carefully, Engage Wisely, and Vote with Integrity (co-authored with Ryan McAnnally-Linz) were released in January and June of 2016. Newbigin House of Studies regularly hosts lectures, performances, and onstage conversations with writers, artists, musicians, and leading thinkers. Featured guests are asked to articulate the important ideas and relevant viewpoints that inform their work and creative process. These conversations are offered in hope that all who attend will be enriched and challenged by the distinctive perspective that faith can add to our lives.